Somerville’s Mayor Joseph Curtatone and Massachusetts’ Undersecretary for Environment Martin Suuberg and Commissioner David Cash from the Massachusetts Department of Environmental Protection celebrated NDEW and Somerville’s commitment to becoming a net zero carbon city. Somerville will install 8 public EV charging stations and add 16 EVs to their fleet using MassDEP funding. Already at City Hall were several Smart Electric Drive city vehicles. The Mayor drove a Nissan Leaf and a smart electric. MassDEP’s Electric Vehicle Incentive Program (MassEVIP) provides incentives to Massachusetts public and private entities, including municipalities, state fleet, universities and colleges, and driver’s education schools, for the acquisition of electric vehicles and charging stations. MassDEP is still accepting applications under MassEVIP Phase 3 until the remaining $1.4 million in available funding is expended. 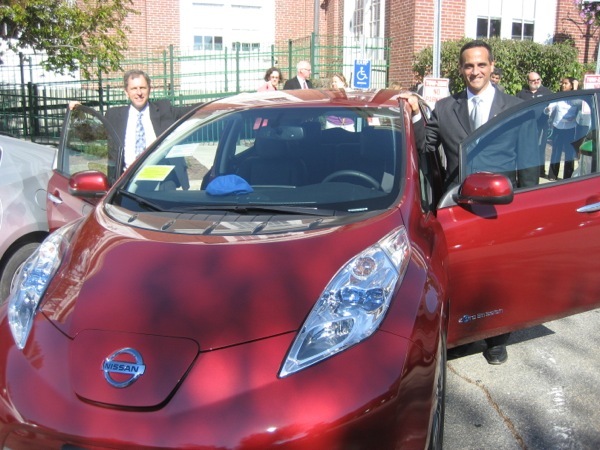 Join us to celebrate with Mayor Curtatone and Somerville’s Sustainability and Environment Office their commitment to install 8 charging stations and purchase 16 plug-in and electric vehicles for the municipal fleet funded in part by a Massachusetts incentive program (http://www.mass.gov/eea/agencies/massdep/air/grants/massevip.html).